Imagine your wedding vow renewal with a beautiful blue Italian sky, rolling green hills and huge sunflowers (the traditional Italian wedding flower) gracing each poll of the chuppah, the bridal canopy. A gorgeous venue and a meaningful ceremony can be yours as you renew your wedding vows in Italy with Rabbi Barbara. Whether you and your spouse choose to travel to the rolling hills of Calabria in southern Italy and stand under the chuppah in the garden or in the historic sanctuary of Sinagoga Ner Tamid del Sud (“The Eternal Light of the South”), Calabria’s first active synagogue in 500 years since Inquisition times, or in another beautiful Italian venue, Rabbi Barbara will personalize your ceremony with traditional blessings, prayers and melodies. Husbands and wives, some married 25 years or more, become brides and grooms again, as they and their families stand together, renewing promises and enjoying rituals that make up the beauty of the Jewish or Jewish interfaith wedding. 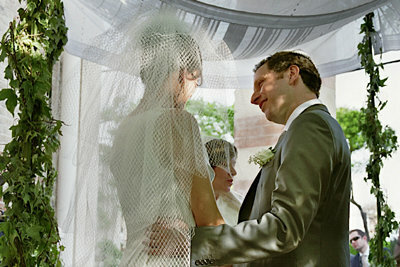 Years ago it was often difficult for interfaith couples to have their wedding ceremony under the chuppah. When rabbis would not officiate or co-officiate, Jewish interfaith couples often opted for a civil ceremony – all the while hoping for the spiritual experience that a wedding under the chuppah brings. "Dear Rabbi Barbara, The renewal ceremony was a surprise for my wife, Janne. I want you to know that I adopted our daughter when she was 7 and she was raised as a Jew. Thank you for involving her in the ceremony. as I feel that I committed to her as well as her mother when we married. Thank you for making the day unforgettable! I am so blessed to have the family I do and to be able to share them with you is a blessing."